From the start, we always envisioned creating a company that would exceed customer expectations through quality home health care. With this vision grew Pro-Health Nursing Services, Inc. – a highly respected provider of comprehensive health care services to patients of all ages. 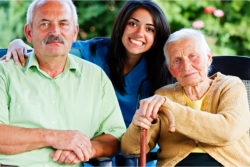 We specialize in caring for our clients who are home-bound. Home-bound is a health situation that renders the individual unable to leave the home environment on his or her own. It also means there are mobility and medically-related issues that prevents the individual from practicing his or her full independence. In effect, home health care becomes a viable demand in the community which is then provided by Pro-Health Nursing Services, Inc.
Is home health care recommended for you by your physician? Call 954-433-2590, we can arrange for the care you need in no time!